WG-500P - Hotspot in a Printer CREATE YOUR OWN PUBLIC HOTSPOT IN A SNAP!!! Wireless Subscriber Gateway with built-in thermal printer to generate users account for Internet access and is perfect for small venue owners. 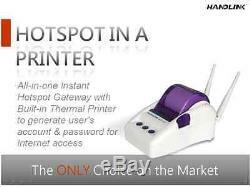 All-In-One Instant Hotspot Gateway with built-in Thermal Printer. Compatible with IEE802.11n/b/g , Wireless 2T2R 2.4GHz with 300Mbps high speed network. Support up to 50 simultaneous devices and up to 256 local accounts. 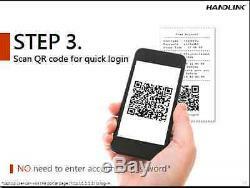 Support QR Code print out - Make more convenient for portable devices to login. AAA Control and Billing Support - Support network access control service including Authentication, Authorization and Accounting (AAA) for internet subscribers and 10 billing profiles. Support Rich Functions- Transparent HTTP proxy, Layer 2 Isolation, Administration access Control, SSL login page and various WAN connections. VPN PASS Through - Run your VPN or Secure tunnelling client software to connect to your companys VPN server. Support WDS function with repeater mode. Allow multiple devices to login one subscriber account. USB to Ethernet connector design to support multiple LAN Device usage. Multiple languages support - For ticket printout format and login page only, language support available in English/ German/ French/ish/Portuguese/ Italian languages. IP Plug and Play Internet Access - Zero configuration Internet access! Connect your office PC, laptop and handheld devices to the network without human intervention. It will automatically configure itself for the network. With BYOD trend today, most people need Wi-Fi access for their works, researches and communications. Therefore, the WG-500P offers you a robust and secure hotspot solution which is just perfect for the mini size venues such as café/ airport lounge/ store or shop. The WG-500P provide customizable billing profiles and internet access with time limit control which is based on our billing management. We also designed No Wi-Fi Signal function setting at the peak time period to avoid clog, such as Breakfast, Lunch, Dinner period. The WG-500P can help to promote your products, services and satisfy your customers. 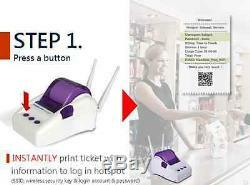 With its user friendly design, venues owners can easily train their staffs to operate the gateway and print out the account ticket to access Internet for their customers. The WG-500P can be used as a standalone authentication gateway to monitor and control Internet access while guests/visitors are visiting. The features of WG-500P support web-based authentication and management tool and marketing cooperation such as walled gardens, an internal portal page, and external portal page redirection. 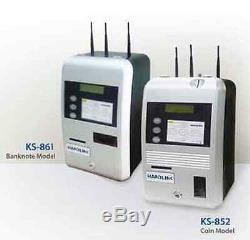 It also offers bandwidth and billing management. In traditionally, the venues who provide a public internet access with the same username and password to guests which are insecure and easy to get identity hijacked. Or they have to take lots of efforts to provide the secure Internet access for guests such as pre-built users accounts with passwords and print them out. Now with advantage of the WG-500P patented Account Generator, the venues can easily generate and print out a private Internet access ticket just in seconds with one press. We also design a login page for venues to key-in guests/visitors identity to fit the laws. According to the law, it requires venue owners to provide the guests Internet usage records for tracking. Thus the WG-500P provides a Real-time session information and the remote site administrator could monitor the real time usage status via Session information page. The WG-500P is one of unique innovation from Handlink, its more than a simple Wi-Fi hotspot device; its also equipped with IP Plug and Play technology so theres no need for end-users to change any settings in the their devices. 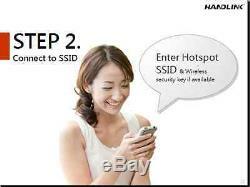 Its fast, easy and trouble free to access Internet. The item "Handlink WG500P public WiFi access point with management and printer WG-500P" is in sale since Monday, September 08, 2014. This item is in the category "Computers/Tablets & Networking\Home Networking & Connectivity\Wireless Access Points". The seller is "alexandre88" and is located in Miami, Florida. This item can be shipped worldwide.